Villa Medeira is an ideally located villa with a choice of good restaurants and cafes within a few minutes walk. The beautiful sandy cove of Coelha is a few minutes further with neighbouring Albufeira around 10 minutes away by car. Free WiFi and air conditioning/heating in the bedrooms is included. Villa Medeira is one of only a few villas in an area near Coelha beach and is an attractive and spacious villa with WIFi and air conditioned/heated bedrooms at no extra cost. The lounge is through an archway from the hall on the right. This is a spacious room incorporating a generous dining area with a large serving hatch to the kitchen. The main feature is the curved end wall with attractive fireplace and plenty of built-in seating. Also to the right of the hall is the spacious kitchen with white units and marble worktops, which create a light and airy atmosphere. There is a small laundry room and a door to the garden at the side. At the end of the hallway are two twin bedrooms. A shower room and a bathroom, both tiled and furnished in white, further enhance the light atmosphere of this Algarve villa. Opposite the archway to the lounge are the stairs to the open landing of the first floor. At the top of these stairs, an archway leads into another lounge area, which is comfortably furnished. There are two sets of patio doors, one leading out to the front balcony and the other opening onto the large terrace at the side with views across the countryside. Leading off the top landing is the master double bedroom with an en suite bathroom. The pool and terrace area is to the front of the villa and is well screened with ivy hedging. From the lounge, you walk out to an elevated covered terrace, with table and chairs, overlooking the pool. Next to the terrace is another covered area with the barbecue. This villa has applied for a licence and the submission number is 450.10.01/2015/712. The licence number will follow. 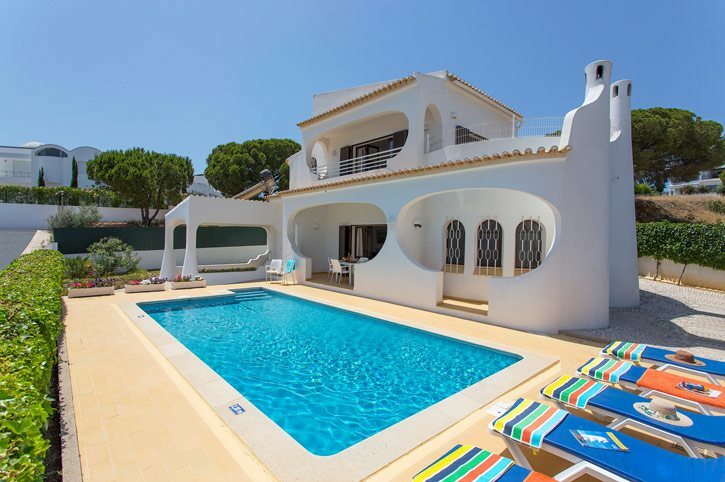 This Algarve villa is close to the attractive Coelha beach, 3 miles west of Albufeira. Coelha, like the other attractive coves and beaches in the area such as Castelo and São Rafael, has an informal beach bar. This Coelha villa is close to the beautiful sandy beach, 3 miles west of Albufeira. Coelha is an ideal location for enjoying an Algarve villa holiday as, like the other attractive coves and beaches in the area such as Castelo and São Rafael, has an informal beach bar. Within walking distance of Villa Madeira, there are also a couple of restaurants, and there is a mini market within a 20 minute walk or 5 minute drive. Within a radius of a couple of miles, there is a good choice of other bars, restaurants and a number of shops. All of these can be easily reached without venturing 'into town'. Albufeira, the Algarve's most popular resort, is three miles to the east, boasting an expansive sandy beach and all manner of shopping amenities and restaurants. A mile and half further is Praia D'Oura with its thriving nightlife scene. Guia, which is approximately 4 miles away, is the renowned home of the typical Algarve dish, spicy chicken piri piri. Further afield, for those with children and a Villa Plus hire car, a choice of water-slide parks, the Zoomarine aquarium and dolphin show are within a 25 minute drive. For golfers, the nearest course is Salgados, just over a mile and a half away, or alternatively the 9 hole Sheraton Pine Cliffs course to the other side of Albufeira, near Olhos de Agua. For those wishing to explore more widely, Villa Medeira's ideal location means that almost anywhere across the Algarve can be reached in an hour or so by car. Villa Medeira is not available to book for season as it is sold out. Take a look here at the Algarve villas that are currently on sale. Really spacious, clean, well equipped and plenty of crockery etc. Pool was great fun. Excellent efficient service from Villa Plus transfers and Reps. Very relaxing holiday! Loved the holiday and villa and will be booking with you next year! The villa exceeded our expectations and everything ran smoothly. The rep checked on us to ensure we were all happy and offered us helpful tips. The location was perfect - within walking distance of shops, restaurants and the beautiful beach. We would definitely consider booking through Villa Plus again and recommend your services to friends. Angela called in to make sure we were ok a few days after arrival. She ensured we had contact details for her and it was reassurring to know there was somone available without them being obtrusive. I look forward to booking a villa Plus again. The Villa was a wonderful place to stay.In my Party was 4 Adults and 2 children so we thought it suited all. Was so lovely to just be able to walk to a fantastic beach within minutes!! The Air conditioning was a real treat...The pool was great and we had lots of fun splashing about.The pool table & Table tennis also a great hit with everyone. The layout of the Villa was lovely, the big open plan lounge/dining area also a great place for all the family. The Villa is situated in a quiet cul-de-sac, very close to lots of fantastic beaches, shops and bar/restaurants This is our 3rd visit to Portugal, but our 1St time with Villa Plus...we'd highly recommend this villa and the company too... Many Thanks, we had a truly fantastic Holiday.